Johann Gottlieb Wendel began his career as a fur merchant with partner John Jacob Astor. The close relationship between the two led to Wendel's marrying Astor's half-sister, Elizabeth. 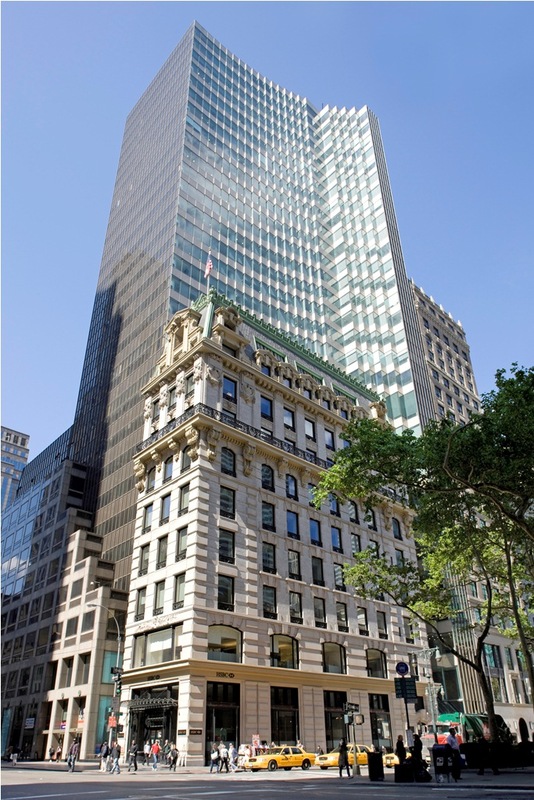 And like Astor, Wendel invested his profits in Manhattan real estate, multiplying his fortune. Johann and Elizabeth had one child, John D. Wendel, who took over his father's real estate business when he died. 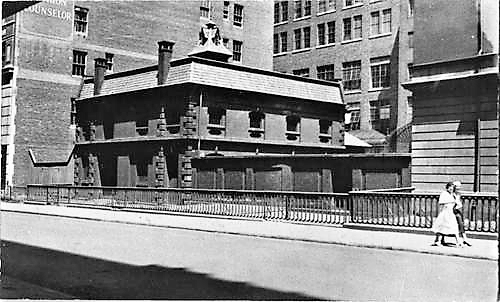 Elizabeth Astor Wendel died on November 28, 1846, leaving her son a vast amount of Manhattan real estate. John D. Wendel and his wife, Mary Ann, had seven children--six daughters (Rebecca, Augusta, Josephine, Henrietta, Georgiana, Mary and Ella) and one son, John Gottlieb Wendell II. Despite what The New York Herald called his "immense wealth," Wendel was notoriously frugal. The New York Times would later say that he "let his contractor draw the plans [of his mansion] to save the architect's fees." That mansion, at No. 442 Fifth Avenue on the corner of 39th Street, was completed in 1856. The up-to-date Ango-Italianate house sat on a rusticated brownstone base. Three stories of red brick rose to a hipped roof atop a bracketed cornice. Two sets of French doors at the second floor facing Fifth Avenue opened onto stone balustraded balconies. Despite Wendel's wariness not to waste money, the family enjoyed the lifestyle of wealthy Victorians. Records show seven servants in the 20-room house. And on March 1, 1860 The New York Times noted that "Mr. John D. Wendel and family have arrived from Paris." Their summer estate was at Irvington-on-Hudson, near George Merrit's impressive "Lyndenhurst." It was there, on September 12, 1876 that the Wendels' eldest daughter, Henrietta Dorothea died. The funeral was held in that house the following day. The New York Herald announced that the funeral would begin "on arrival of the 2 P.M. train from Grand Central depot. Carriages will be in waiting." One month later John D. Wendel died, also at the summer estate. The New York Herald, on November 30, commented "Mr. Wendel was one of the very few survivors of the class of United States merchants whose frugal industry, exact business habits and unswerving integrity will soon be without a living representative." 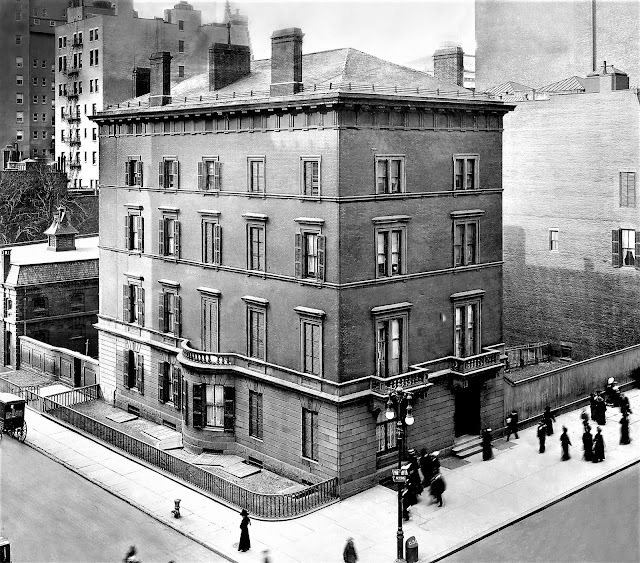 Mary and her six surviving children--all unmarried--continued to live in the Fifth Avenue mansion. Possibly because of her husband's famous frugality, little inside had been changed since the house was opened in 1856. In 1893 the neighborhood around the exclusive Union League Club, on Fifth Avenue and 21st Street, was rapidly becoming commercialized. 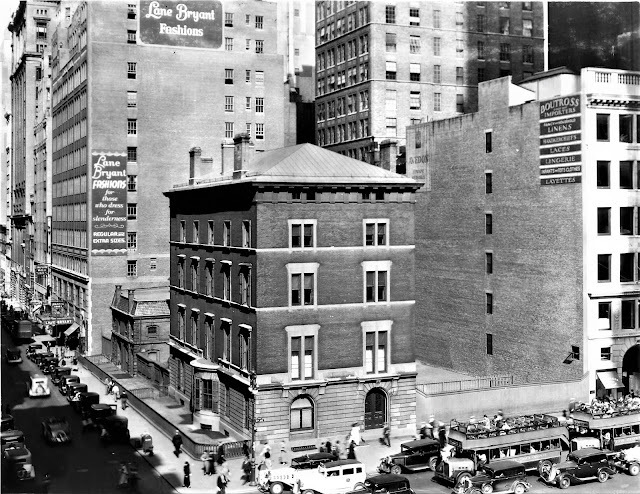 The members began searching for a new location further uptown and on October 11 the New-York Tribune reported "It has a hope of getting the northwest corner of Thirty-ninth-st...where the widow of John D. Wendel lives, and adjoining which is a vacant lot." The Site Committee would have to keep looking. Mary was not interested in selling. And the "vacant lot" was no such thing--it was the Wendels' garden, by now an exquisitely valuable piece of Midtown property. 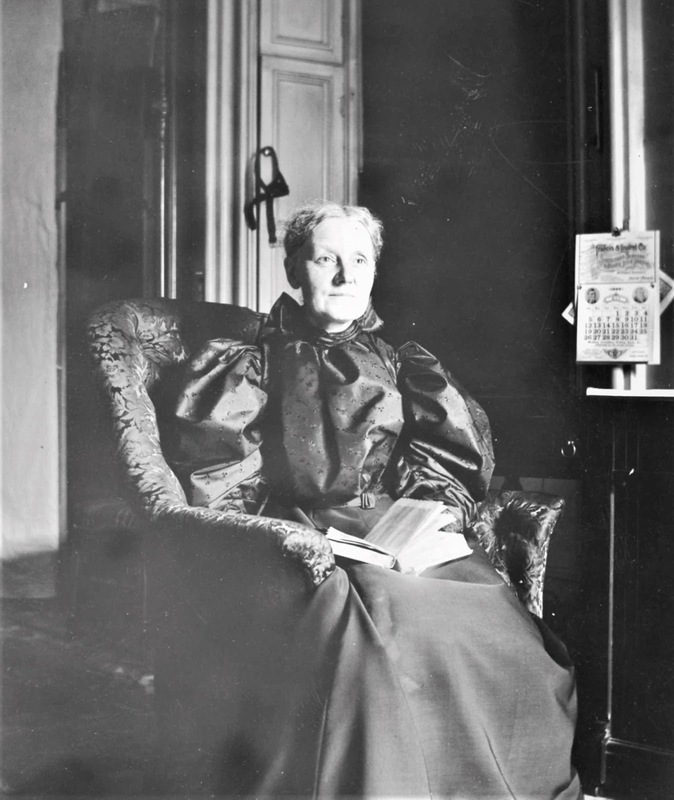 Mary A. Wendel died on the evening of March 30, 1894. Her son, John Gottlieb Wendel II, did not open the house for her funeral, as would have been expected, but held it at the Madison Avenue M. E. Church. It may have been a hint of things to come. While each of the girls received $340,000 in stocks, John inherited the bulk of the $10 million estate. A month earlier The Evening World had reported on John's wealth, unaware of course of his pending inheritance. His personal worth was already estimated at $1.5 million, his annual income at $75,000 and his "daily income" at $205 (the daily income would equal about $7,350 today). While his father had been frugal, John G. Wendel was miserly. And he controlled his five sisters tyrannically. Terrified that the family fortune would be diluted, he refused to allow them to marry, and put an end to entertainments and most outside socializing. The New York Times later explained that he "taught them they must not marry or dissipate their stewardship and that publicity was demeaning." Wendel's eccentricities went beyond his control of his sisters. According to Daniel Okrent in his 2003 Great Fortune, he was "something of a paranoid: fearful that disease could enter his body through his feet he stomped around in a custom-made, mutant form of platform shoes, their inch-thick gutta percha soles extended by fenders reaching another full inch in either direction." Although he said it was his lack of confidence in the police that caused him not to report a robbery in the mansion; it was more likely that he simply did not want strangers coming in. In either case, when the family closed the house to go to Irvington in 1894, he left caretaker Samuel McKinney to watch over it. When they returned "it was locked up and McKinney had disappeared. A quantity of cash and bonds had also vanished," according to a newspaper. 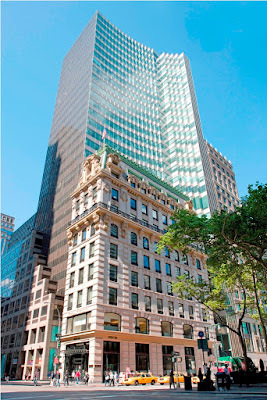 Years later, on June 8, 1899, The New York Times wrote "When John G. Wendel lost $6,000 in cash and bonds from his home, 444 Fifth Avenue, nearly four years ago, he exhibited less anxiety over the matter than he might have been expected to feel." The matter would never have been discovered had McKinney not beaten his wife, Rosa. In retaliation she went to the police and told all. In January 1899 47-year-old Georgiana Wendel tried to break free of her brother's iron grasp. She escaped to the Park Avenue Hotel. Apparently to hide her tracks, she checked out on Sunday night, January 22, but retained the key. The New York Times reported that she "returned quietly" and "having the key in her possession, went to her room without saying anything to the hotel people." When the suite was given to another guest the following afternoon, she was discovered. Her brother had her deemed insane and sent temporarily to Bellevue Hospital. Georgiana was then removed to the Irvington-on-Hudson house where she was in effect held prisoner. The feisty heiress did not give up easily, however. She communicated with two friends, Mrs. F. W. Mack and Mrs. Maurice J. Sullivan. They obtained a writ of habeas corpus to have Georgiana appear in court "to be examined as to her mental condition," according to The New York Times on September 6, 1900. But she did not appear. The article noted "Both Mrs. Sullivan and Mrs. Mack had visited the Wendel Residence in Irvington on Aug. 22, but were not allowed to have an interview with Miss Wendel, although she spoke to them from an open window. The women say they think she is perfectly sane, and that she is restrained of her liberty by her relatives." The attorneys of John Wendel presented an application to the court stating that Georgiana "is incompetent to manage herself and affairs by reason of loss of memory and understanding." Judge Smith Lent said he saw no reason why Georgiana had not been brought in for examination. Wendel's lawyer responded "They do not dare to produce her here!" Lent ordered her to be produced in court the next day. When Georgiana did not show up, Judge Lent took the court to the Wendel house in Irvington. The Times reported "She declared that she was restrained of her liberty by her brother, John G. Wendel, who wanted to get her money." But sadly, when Wendel testified that he had not seen his sister for nearly two years, Georgiana was deemed "undoubtedly suffering from delusional insanity." In the meantime, John's peculiarities affected his Manhattan neighbors to the rear. No. 1 West 39th Street, next to the Wendel carriage house, was owned by Neville P. Jodrell and his wife. In the spring of 1900 they began remodeling the old brownstone into a modern, American basement plan residence. The architects included windows on the side wall that opened onto a shaft for ventilation. Wendel suspected they secretly wanted views into his house. He retaliated with a wall. On May 12, 1900 The Times reported he had hired architects J. B. Snook & Sons to erect a foot thick, eight-foot wide wall that would rise about 28 feet "to be build right up against the Thirty-ninth Street house in front of the windows." John would have to refocus his attention from spying neighbors to his relentless sister, Georgiana before long. She had managed to get the verdict of insanity upset "on the ground of irregularity" and now, in September 1901 she sued her brother, claiming that he had not distributed their father's estate in accordance with the will. She wanted her rightful share. Georgiana escaped to Europe where she was still living in 1907 when she finally capitulated. The New York Times reported "A reconciliation was effected. Miss Georgiana returned willingly to the family roof." On November 25, 1906 the Colorado Herald Democrat reported on the family's bizarre anachronistic lifestyle. The article told of the last unimproved lot in the Fifth Avenue business district, the Wendel's former garden, now neglected and barren. "To the south of the vacant lot stands an old-fashioned red brick house of the type that belonged to the Fifth avenue grandeur of bygone days." The journalist continued, "Land in that neighborhood is worth more than $10,000 a front foot, and yet this lot has a high board fence around it and lies entirely idle." Brokers, he said, "were ready to give $600,000" for the lot. But the Wendel sisters would not give up the garden lot, because, for one thing, it was the only spot where Toby, their dog, could romp. The far-away publication was not the only one noticing the strange behavior of the mansion's occupants. The New York Times remarked "Because of his aversion to automobiles and other modern improvements [John Wendel] became known as 'The Hermit of Fifth Avenue.'" Around 1912 Rebecca Wendel became only sister to successfully break free. Despite what a newspaper called her brother's "violent opposition," she married clergyman Luther Arthur Swope. "Thereafter John Wendel discouraged his sisters from going to church," said The Times. Josephine died in the spring of 1914, her $3 million estate being divided among her siblings. John G. Wendel died a few months later, on November 30, leaving an estate valued at $55 million, according to The Real Estate Record & Guide on December 5. He left control of the family estate in the hands of Rebecca. 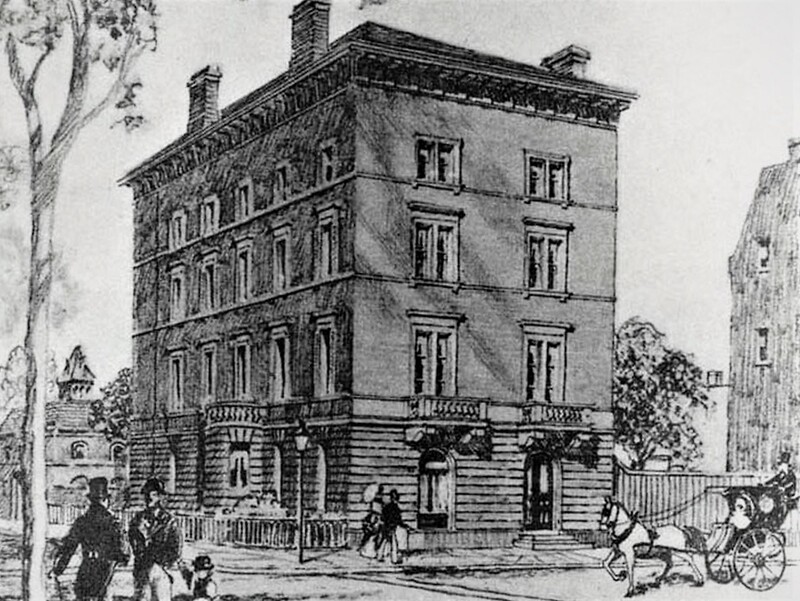 Mary became the financial executive for the three sisters in the Fifth Avenue house. In reporting on John's death The Times said "He lived as simply as a $25 a week clerk with his two [sic] sisters in his big square house on the northwest corner of Fifth Avenue and Thirty-ninth Street." There was no telephone, no electric lights, no conveniences inside. Not even a sewing machine for mending the clothing. On February 28, 1915 The New York Times again described the house of the Wendel sisters. "In Winter only the first two floors and the basement are habitable, because the old furnace does not carry heat well above the second floor." It mentioned that in the side yard was "an old tree and a dog house, with a turf that has not been cut in thirty years. There, after dark, so that no prying eyes can spy down from neighboring buildings, the sisters take their exercise." "With them are two old women servants, and the five old women live curiously oblivious of the New York of the moment. The riot of fashion, extravagance, joy, mirth, sin crime, pride, and ambition which flows past them on the avenue constantly seems not to have affected them at all." Self-isolated, the aging women rarely had visitors. "Of social life the old house has absolutely none. No outsider has dined there in years. With a few of the old New York families the Wendels still retain friendly relations, and on very rare occasions they receive a call, but as they never return these calls, and as they rarely call on any one themselves, their visitors become each year fewer and fewer." Oddly enough, years later The Times would mention "There was very little exchange of affection between the sisters who lived in the same house. They simply spent their lives side by side." In October 1922 Mary Eliza Astor Wendel died at the Irvington-on-Hudson estate. Other than bequests to servants, her $15 million estate was divided among her sisters. Ella and Georgiana continued on as always. 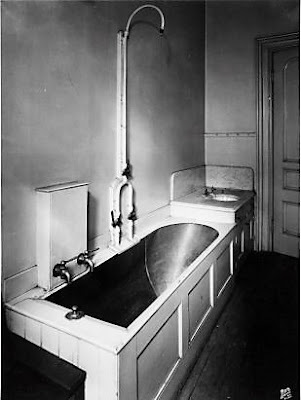 Their lawyer, Charles G. Koss, explained "They simply wished to live alone with their servants in their old home surroundings, and they lived just like anybody else." That assertion was arguable. In 1929 Georgiana was stricken with influenza which developed into pneumonia. She died on January 18 at the age of 79. Her death was only discovered by the public when her sisters filed for the administration of her estate. Not long afterward The Times described No. 442 Fifth Avenue saying, "it has never been changed. The dining room, parlor and library, it is said, are scrupulously kept in the exact condition in which they were left by the builder of the house, John Wendel." On July 20, 1930 Rebecca A. D. Wendel Swope died, leaving Ella the sole surviving sister and the end of the Wendel line. Newspaper readers were somewhat shocked, although surprisingly so, when her entire estate was left to the 80-year old Ella with nothing at all left to charity. One of the most bizarre chapters in New York's social history was about to close. Eight months after Rebecca's death, 78-year-old Ella Virginia von E. Wendel suffered a stroke. She died in the Fifth Avenue house a week later, on March 13, 1931. Her massive estate had made her the equivalent of a billionaire today. The Times reported "The real estate accumulated in the name of Wendel is now valued at more than $100,000,000 and the only living creature that was close to the last holder was a French poodle named Tobey." 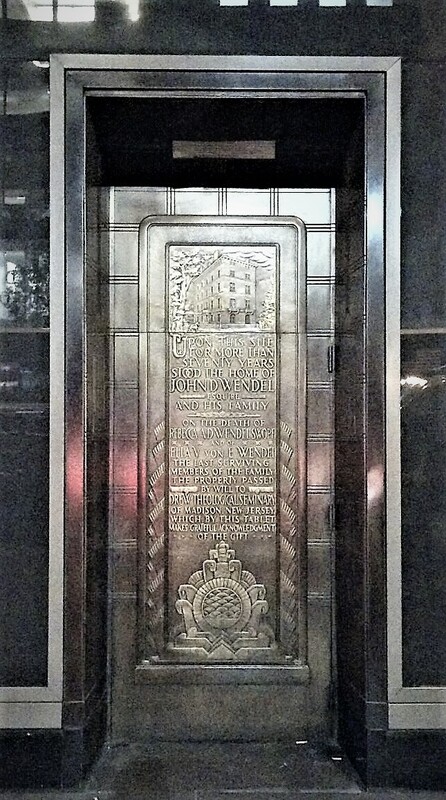 In accordance with John G. Wendel's distaste for publicity, there was no crepe hung on the door (nor had there been at the time of his or the other sisters' deaths). Her funeral was held on March 16. 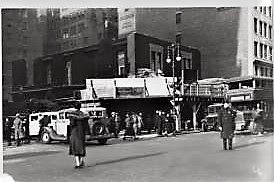 Four years later the Art Deco S. H. Kress & Co. flagship 5-and-10-cent store was completed on the site. That magnificent structure was demolished in the mid-1980's to make way for Republic National Bank tower. A door-sized bronze plaque memorializing the Wendel mansion was removed from the Kress Building and installed in the new structure. Fascinating story! I wonder who got Ella's billion - Toby? It took some court wrangling, but it all went to charity in the end. Not visible in the bottom photo is the depiction of the Kress building, inset to the side of the memorial doorway.